Terry Renshaw of The Shrewsbury 24 Campaign was the invited guest speaker at the April meeting of the Branch. Terry outlined the history of the campaign to overturn the unjust prosecutions of 24 building workers following the first national building workers strike in 1972. The workers, all UCATT members, were arrested and charged with conspiracy, unlawful assembly and causing affray, apparently just for organising and forming picket lines at a McAlpine construction site. At subsequent trials held in December 1973, January 1974 and February 1974, 6 workers were sent to jail whilst others received suspended sentences. The Shrewsbury 24 have since campaigned for their cases to be referred to the Court of Appeal and hopefully, to have these miscarriages of justice overturned. Such a Court action might incur significant costs, currently estimated to be in the region of £150,000. Unite the Union has pledged to underwrite a substantial portion of the costs, with the remainder being dependent on donations. Branch Chair Jake McLeod thanked Terry for his presentation. 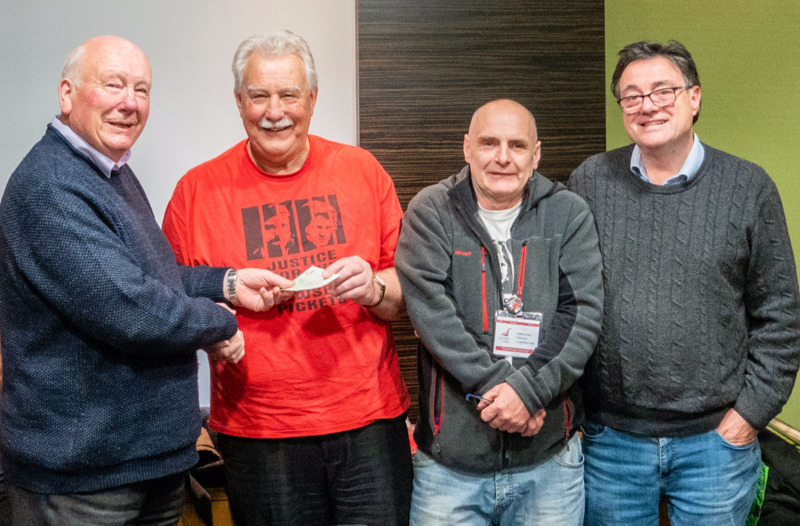 In addition to the Branch affiliating to the campaign, a collection from the 35 members present raised the sum of £273.00 by way of a donation. The growth of the far right in the last year—from openly anti-Semitic parties in government in Poland and Hungary, fascists in the German parliament and the Austrian government, to Trump in the White House and Bolsonaro in Brazil—underlines the urgency of the task facing us all to build a broad based movement against racism and fascism in Britain. We urge you to support the call from Stand Up To Racism—a coalition of civic organisations, refugee and migrant communities, as well as trade unions, political organisations and individuals—to join the day of international protests around UN Anti Racism Day on 16 March in Glasgow - assemble George Square, Glasgow, 11am. The demonstraion is backed by a number of organisations including Unite Scotland, Glasgow Unite Area Activist Committee, Glasgow & West Of Scotland Unite Retired Members Branch, and Glasgow Unite Community Branch. If you who have younger relatives and friends from Glasgow seeking to return to education, the Glasgow Educational & Marshall Trust provides funding for the people of Glasgow to advance their academic or vocational qualifications - whatever age or stage. The Trust gives grants to people who have lived in Glasgow for over 5 years to assist with furthering their education. 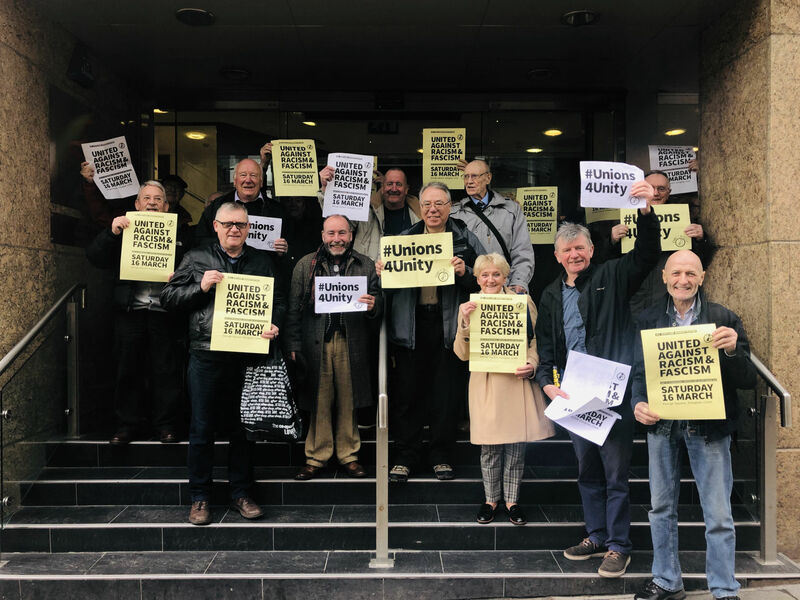 The Scottish Pensioners Forum organised a demonstration to protest against the proposed withdrawal of the free TV licence for those aged over 75. The demonstration took place at 11.00am on Friday 1st February at the BBC Scottish Headquarters at Pacific Quay. Photos of the demo can be viewed here and the words of a song written by the Branch's own singer/songwriter (and Treasurer) Maureen Gardner can be downloaded here. The latest editon of teh Unite REtired Members Plus Newsletter can be downloaded here. Topics covered include: Residential Education Course; Social media as a valuable campaigning tool; the abortive plot by the Rees-Mogg Brexiteers to ditch the Prime Minister; In Britain’s boardrooms, Brexit is already here. And the warning is stark; Labour Party Liverpool Conference Report 2018; and Report of the URM Campaign Team (October 30th) and National Meeting Held on October 31st 2018. Branch members were prominent among those demonstrating at the Scottish Parliament on Thursday 27th September to celebrate the United Nations Day of Older Pesons. The gathering was addressed by a number of speakers including MSPs and our own Branch Treasurer Maureen Gardner who is also a stalwart of the Scottish Pensioners Forum. On Saturday 6th October, the Branch organised a stall in Buchanan Street and leafleted passers-by and encouraged them to sign our petition calling for the retention of the free TV licence for those over 75. ♦ David Paterson was elected as Education Officer. ♦ The Branch agreed to support the demonstration at the Scottish Parliament on Thursday 27th September at 10.45am to mark United Nations Older People's Day. The Scottish Pensioners Forum is calling on the Scottish Governmment and MSPs to recognise the contribution and dedication that older people have made, and continue to make, to help safeguard welfare rights during the past 70 years, both in policy making, campaigning and in wider society as a whole. ♦ A number of Branch members will be visiting the Forth Valley Retired Memebrs Branch on 17th September. ♦ The Branch's Xmas Lunch will beheld on Thursday 6th December at 12.30pm. Further details and tickets at the October Branch meeting. Jake McLeod - Chair of the Glasgow Retired Members sat down to tell us about retired members activities; including their song club, and their role in assisting other campaigns. Steve Turner - Assistant General Secretary. Steve Turner came visit our retired members in Scotland, and to find out more about what they are doing. There are a number of other comments, events and images we have shared with our followers on our social media streams you can find on our streams below. for	Inverclyde	and	the	west	coast. Click here for further details of the campaign and click here for a 200+ page report on the Peel Group.